US credibility is critical to achieve a nuclear deal with Iran. The Framework Agreement (also referred to as the Joint Comprehensive Plan of Action) on nuclear non-proliferation between Iran and the P5+1 (Britain, China, France, Russia, the US, and Germany) is a key stepping stone toward achieving Comprehensive Agreement. The survival of the Framework Agreement—and certainly its progress—however, depends on the US administration’s credibility, both regionally and domestically. There are two parameters to evaluate US credibility: foreign, and domestic policy outcomes. In this analysis foreign policy credibility is articulated as the ability (a) stabilize actor in the Middle East (ME), and as a corollary (b) guarantee the security interests of regional partners in the ME. On the other hand, domestic credibility denotes a united strategy and approach wherein the US executive and legislative authorities work together to enhance external credibility. US administrators and analysts tend to offer a narrow definition of stability: order, security, and predictability; together they form the foundation of the so-called regime stability. Regime stability means maintaining a regime’s characteristic features—norms, institutions, and authority structures—over a period of time. In the US, the ‘Middle East Peace and Stability Law’ is a federal legislation that authorises the US President to provide cooperation and assistance to any country or group of countries in the ME in order to enhance regime stability (presumed to be in America’s best interests). The assistance is provided on a country’s request for the development of economic and military strengths aimed at the maintenance of its national independence; military assistance programmes are also initiatives under the legislation. Typically, ME governments that receive such assistance must be favourable towards US interests. Stabilizing the ME also implies preserving the status quo, i.e. regional balance of power. This requires maintaining US-ME bi-lateral security alliances (including US troop presence in the region). Yet, for regional partners, US foreign policy credibility in the ME is fast eroding. Judged on policy outcome merits alone, the US has not been a stabilizing actor. On the contrary, the US—caught between buttressing authoritarian allies and championing democratization and human rights—did not intervene to prevent the fall of long-time ally Hosni Mubarak. Similarly, the US has been reluctant to act against Iranian meddling in Syria and Iraq whilst doggedly pursuing a nuclear deal with Iran which Israel and Arab states view as evidence of American miscalculation (or gullibility) vis-à-vis Iran’s rise. 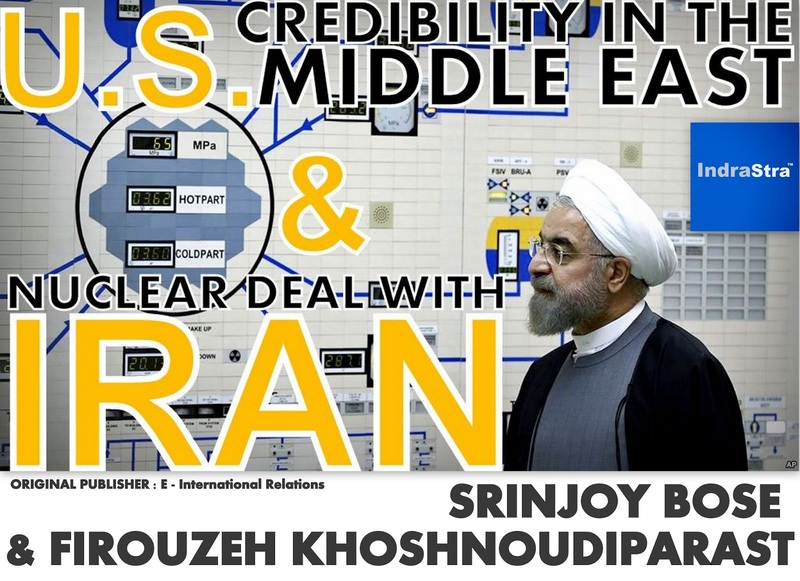 These perceived shortcomings add context to the ongoing nuclear negotiations with Iran. First, regional partners Israel, Saudi Arabia, UAE, Qatar, and Turkey view Iran’s influential presence in Iraq, Syria, and Yemen (where Tehran is alleged to be backing Houthi forces) as destabilizing factors. These partners have voiced their displeasure at the US’ inability to compel the Tehran-supported Shia-majority administration in Baghdad into being more representative. They point to US failure in this regard as a major factor in the Islamic State’s emergence. Today, the Islamic State movement controls vast swaths of territory in Iraq and Syria, effectively redrawing the map of the ME. The US also drew the ire of its regional partners when it refused to intervene in the Syrian civil war. Despite Iran’s patronage of Bashar al-Assad’s regime, the US justified non-intervention by arguing that the Syrian regime did not pose an immediate and direct threat to US national interests. Some critics have argued, therefore, that current US policy in the ME is unreliable and spineless, compromising its foreign policy credibility. Second, given that important regional partner-states view regional stability and balance of power as contingent on American security guarantees and presence in the region, shifts in the US-led system of alliances away from the ME (in late 2012 the Obama administration announced the ‘strategic pivot’ or ‘rebalance’ to East Asia and the Pacific) has contributed further to the regional partners’ anxiety. They fear a power vacuum left behind will pave the way for a broader détente with Iran, which in turn will increase and expedite Iran’s meddling. For these reasons, the US’ foreign policy credibility in the region is fast eroding. Last, but not least, the same regional partners fear that a nuclear deal with Iran is being pursued at the expense of regime survival and regional stability. They fear that if the US is unwilling to confront Iran in Syria or Iraq, a potential nuclear agreement with Iran will further undermine regime stability and the status quo balance of power. Saudi Arabia, for instance, believes that trimming Iran’s regional influence would increase the chances of a better nuclear deal in the future. Some estimates suggest that Iran will stand to gain up to US$420 billion in the next fifteen years (a consequence of the lifting of sanctions on its foreign exchange holdings and oil revenues); the fear is Iran will use this money to fund its current regional policies in the ME. In anticipation of a financial windfall for Iran, the Sunni Arab states have stepped up consultations with the White House on creating new security arrangements. Arab leaders will be convening the Gulf Cooperation Council (GCC) countries in May 2015—at Camp David—to discuss the US’ mutual interests with GCC member states. One analyst mentions that early behind-the-scenes talks in preparation for that meeting “suggest that an effort is afoot to formulate some kind of defence pact that might counteract Iran’s thrusts into the region and provide security in the wake of some change of course, should Iran choose to break out of the nuclear pact”. A recent Congressional Research Service (CRS) reportmentions, short of a defence pact, the potential for a nuclear accord with Iran has prompted a GCC examination of alternative security arrangements. The GCC countries have already announced plans—formalised at the December 2014 GCC summit in Qatar—for greater military command integration and defence coordination. And, as the Yemini case shows, Saudi Arabia appears increasingly willing to build Arab coalitions to undertake military action in the region. Although the White House has objected to this, it is nonetheless taking measures to shore up its security guarantees. Just days before the signing of the Framework Agreement with Iran, the White House resumed weapons sales to Egypt (sales had been suspended in October 2013 following the Egyptian military’s crackdown on the Muslim Brotherhood), is nearing a deal to supply the United Arab Emirates with a fleet of Predator drones, and gave its blessing to the Saudi Arabia-led Arab coalition fighting the Houthi forces in Yemen. In fact, the US has set up a “Joint Coordination Planning Cell” via which it isproviding intelligence and targeting support for sites the Saudis want to bomb, and the US Navy is backing a Saudi naval blockade of Yemen’s ports by searching for Yemen-bound weapons on the seas. Clearly, the US administration is trying to assuage growing fears among Sunni Arab countries that want military superiority over Iran. The Executive’s authority to enter political arrangements like the [Framework Agreement], without first obtaining the approval of Congress, has been the subject of long-standing dispute between the political branches. Nonetheless, the executive branch has long claimed the authority to make such commitments on behalf of the United States without congressional authorization, asserting that the Executive is not subject to the same constitutional constraints in making political commitments to foreign countries as is the case when entering legally binding international agreements. Recently, Congress even attempted to introduce legislation (the Kirk-Menendez Bill) that would imposenew sanctions on Iran whilst negotiations were ongoing. The White House threatened to veto such legislation, arguing it will force Iran to abandon talks and may even cause some countries to end their cooperation with international sanctions. The domestic conundrum translates into a crisis of external credibility for the US. First, the squabbling not only prevents the executive branch from implementing policy effectively—Secretary of State John Kerry, the principal US negotiator at the talks, conceded that any agreement with Iran may not be legally binding—it also undermines a key pillar of diplomacy: that of speaking with a united voice. Disunity implies US interlocutors are negotiating from a position of ambiguity and/or weakness; for ME stakeholders (especially Iran and Israel) this does not imbue much confidence in the process, much less substance of the agreement. And yet, neither Israeli Prime Minister Benjamin Netanyahu nor the Republican Party seems to appreciate this subtlety; Prime Minister Netanyahu’s address to Congress in March 2015 is evidence of this. The address represented a triumph of tactics (Israeli and Republican political maneuvering) over strategy (Washington’s role as a credible deal-broker in the ME). Second, the White House is waging a two-front diplomatic war—with Iran on one side; and Israel, Saudi Arabia, UAE, Qatar, and the Republican Party opposed to the framework on the other side. Negotiating the different interests and demands is proving a thankless task; this despite President Obama pointing out that the afore-mentioned actors have not put forward a viable alternative to the Framework Agreement. To conclude, the US needs to reaffirm its foreign policy credibility. Shared foreign policy interests—between the US and its regional allies in the Middle East—involve maintaining regime stability, guaranteeing the security interests of allies, and ensuring the status quo balance of power in the region. The US credibility in the ME depends on the successful implementation of policies that help realize these shared interests. For those partners and stakeholders skeptical of and/or opposed to a nuclear deal with Iran, negotiation outcomes is viable only if the US administration guarantees the above interests. Domestically, an Administration and Legislature at odds with each other will struggle to ensure regional allies’ interests, much less engender confidence in future US attempts to broker deals and peace. The external and domestic complexities highlight the need to revisit diplomacy in order to underscore shared interests, and investigate ways of engendering US credibility. The parameters of the Framework Agreement / Joint Comprehensive Plan of Action form the foundation upon which the final text—Comprehensive Agreement—will be written between now and 30 June 2015. The Framework Agreement states that “important implementation details are still subject to negotiation, and nothing is agreed until everything is agreed”. The US’ regional partners include Israel, Saudi Arabia, Kuwait, Bahrain, Turkey, Qatar, United Arab Emirates (UAE), and Egypt. Srinjoy Bose is Prime Minister’s Endeavour and PhD Scholar at the Asia-Pacific College of Diplomacy, Australian National University. Firouzeh Khoshnoudiparast is a PhD Scholar at the Centre for Arab and Islamic Studies (Middle East and Central Asia), Australian National University.